Dairy Free Ranch Dressing you guys!! I have never met a soul that didn’t like ranch dressing. When we went vegan, my husband really missed ranch. 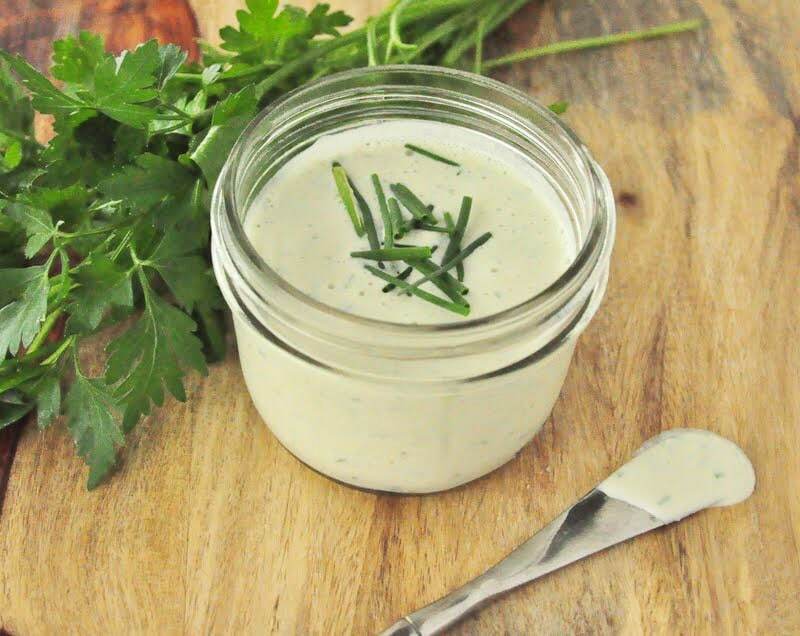 We wanted to make a dairy-free ranch dressing that would really curb his craving. This dairy-free ranch recipe really hits the spot. I don’t know about you, but it seems as though a lot of people have dairy sensitivity lately. My husband and I are lactose intolerant and my younger daughter is allergic to dairy and soy. Most of the non-dairy recipes I have seen online use tofu or veganaise as a base. I was looking for a way to make a soy free ranch dressing recipe and it totally worked! This is just as easy as the Homemade Peanut Butter and the Healthy Honey Mustard! This yummy dressing passed the ultimate kid test. My 4 year old loved it! So, now those of you with kiddos that are dairy sensitive can enjoy the taste of ranch. I was actually amazed at how well this turned out. I had my doubts in the beginning. So here is the recipe. If you like this, you may also want to check out my dairy free sour cream and my dairy free pesto sauce. Place the cashews in water and soak overnight in the fridge. Drain and rinse the cashews and throw them in the blender with just enough water to cover. Blend them for about 1-2 minutes. Now add the rest of the ingredients and blend on low for another minute. That’s it! This made about 1 1/4 cups and should keep for a few weeks in the fridge. I store mine in recycled glass jars. Can you use macadamia nuts? They may work too. Can't you just use mayo? It's dairy free, maybe not soy free I guess. Cashews wouldn't work for those with a nut allergy. I don't eat eggs either, so I can't use mayo. There is a mayo that I believe is soy, egg, and dairy free by Hampton Creek, or at least I believe that is who makes it. It is called Just Mayo. We started using it because my husband (who has chrons and a severe gluten sensitivity) hasn't been able to handle any dairy, and "regular" condiments were upsetting his system even when there was no dairy or gluten in them. As someone who grew up on Hellmans, I can't tell the difference. I have heard of that, but haven't tried it yet. Even though I enjoy some vegan mayo on occasion, this is great for a recipe using whole foods. That's why the blog is called my whole food life. Mayo is very processed. Thanks Melissa! Thanks for sharing this I can't wait to try it my daughter loves her veggies and her Ranch :( We eat so healthy otherwise it never really bothered me (she didn't use a ton) but now that she is dairy free I'm excited to get something healthier in there...I guess I thought it would be hard lol. I can handle this!